In this second part of our 3-part article we are going to cover the second reason we get here so easily. 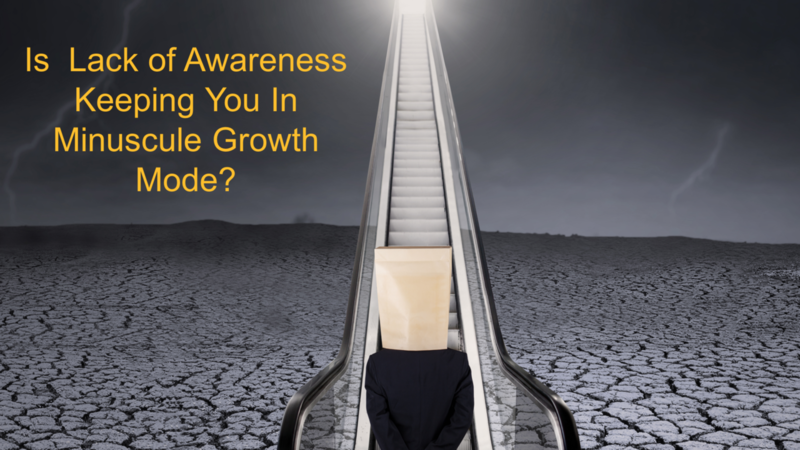 The second reason that we as entrepreneurs get this small growth tunnel vision is because of a lack of awareness of all the massive growth possibilities that exist for us to use. Now we don’t usually do this intentionally, we don't mean to ignore things and ignore this wider view of massive growth, but sometimes we just lose sight of the big picture. It is this lack of awareness that is keeping you in this minuscule growth mode because of this severely limited vision of what you could accomplish if your mind was wide open to all the growth possibilities that are right here at your fingertips, right now. Did you realize that 80% of massive growth success is psychological and mindset driven and only 20% of it is tactical. If you were to ask any professional athlete about their own massive successes, they're going to tell you that only a part of it has to do with the mechanics of throwing the football or throwing the baseball. They'll tell you that the majority of the reason for their success was their mindset. It was the visualization, the mental preparation that really led them to this victory in the ball field. Yet most entrepreneurs and small business owners go about their lives really spinning their wheels without some kind of a solid framework for growth and for setting growth goals and having a positive psychology to make major success happen for them. We get trapped into thinking that it's the next three step mail sequence or the next Facebook strategy or search engine optimization or the next employee that we hire that will take our business to the next level of massive growth. But really, it's the mindset and the powerful psychology that we need so that we can open up all the growth possibilities and get us out of tunnel vision and into a wider view. I remember not long ago, before I sold my industrial repair company, at that time I had only one salesperson, this guy was my entire sales staff. It was all on his shoulders. And at the time I thought that's all I needed since we were doing OK. Things seemed to be going fine, until one day, I checked my e-mail and I ran across an email that was intended to only go to that one sales guy, but it was accidentally CC’d to me also. That e-mail was an offer for employment for him. You know my one only sales guy, the guy was that I relied on so much was being head hunted by my biggest competitor. At that time I was mortified. I was completely surprised at this. This one guy had been with me for years and we were doing great, but he was considering going work for my competitor. I was completely ignorant, completely unaware of the possibilities of losing this key employee. But that wasn’t the worst part because him his leaving wasn't his problem, it was my problem. This problem was not an employment problem or sales problem it was me having this tunnel vision problem. I simply wasn't aware my mind had become so closed off to any new ideas on growing my business that I foolishly left myself unaware about the possibility of being without a sales person. It was my fault for thinking that this linear growth model was the one and only way for me to grow at all. So, it was really then and only then that I realized that I should have been thinking more about continuing to grow my business in new and different ways instead of becoming comfortable and not limit myself to only one linear growth model that I was using at a time. I should have been able to open up and think about growing the business and constantly making myself aware of new ways to grow it. Unfortunately, it took this almost disastrous event to force me to open my mind and get ready and ripe to even consider better growth opportunities. It took this to get my get my mind right. So, don’t allow a lack of awareness to unintentionally keep you in this tunnel vision mode.